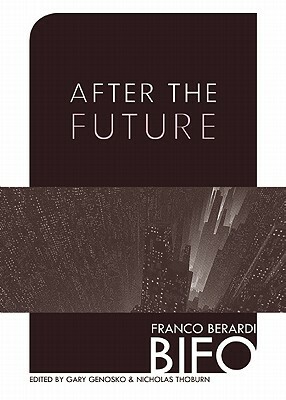 In After the Future, the Italian autonomist philosopher Franco Berardi presents us with the present. The long haul towards progress is shown to have groaned to an exhausted halt. We see ourselves climbing out of the steel contraption hurled forth by the Futurists and peering out at the sprawling landscape of the fractalised cells that we have become. Berardi’s latest work offers us a bold invitation. He invites us to acknowledge that the conception of the future that we believed in for the last hundred years - the future that propelled the industrial age and nourished the financialisation of capital - is dead. This decidedly alinear work begins and ends with a manifesto and, in between, Berardi walks us around the plains of the present, chronicling the complex constellations of power that are impeding our self-love. Berardi outlines what he sees as the fallacy of industrialism: that great accumulation of products leads to progress. Marinetti’s Futurist Manifesto of 1909 heralded the age of industrialisation. The Futurists praised the car as being the pinnacle of beauty. For them, the car was steel, in motion, heading into a prosperous future. Berardi wants to wake us up and take us to see the car, at a standstill. Motionless in the traffic of accumulated speed machines: ‘Speed has slowed down.’ With the introduction of the ‘consensual hallucination’ that is the Internet, the speed of the futurists is no longer externalized in an industrial object. It is now within us. We are info-machines, the cognitive proletariat - what he calls the ‘cognitariat’. He asserts that our product is no longer a tactile object. Instead, we deal in signs and, in this semiocapitalist system, the time of the cognitariat human is depersonalised. The new worker that Berardi shows us stands in contrast to the industrial worker, whose labour was valued in terms of the time it took. He explains that when products were more material, they took a specific amount of time to be made. But the time it takes to proliferate information is not so easy to value. This puts the worker in a precarious position with no direct relation between labour and capital. For Berardi, dissidence between time and work is of special concern when the space in which work is done is endless rather than bound by the factory walls. His contention is that in the virtual utopia of the web there is unending space but yet time is still finite. It is still human time, and it is born and dies with us. Our time can be exhausted whereas the space of the Internet can seemingly continue expanding indefinitely. This tension, between finite time and infinite space, is what Berardi sees as the cause of an epidemic of a panic-depressive cycle. The producing masses are immobilized by a surplus of available information and so they have to depend on automatons - decision-making devices that can speedily work through available information and act on probabilities. Berardi calls this the ‘paradox of the decider’, where the decider does not have the time to assess and understand the available information so instead relies on an automaton to default on his or her behalf. Berardi shows this paradox occurring at all levels, exemplified in world leadership such as at the G8/G20, where no change-making decisions are ever made. Berardi shows us to be just going through the automaton’s motions and asserts that these motions are slowing down. Throughout this book, the slick, forward motion of the Futurists is shown to have lulled to a halt. This slowing down is due to the sprawl of the Internet and the result has been a vast landscape of dehumanized cognitariats producing endless signs, with less and less content, disconnected from their bodies and unable to adapt fast enough to this psychic demand. This is the dystopic reality that Berardi - who frequently writes under the moniker ‘Bifo’ - exposes us to. And when I say dystopic I do not mean it in the purely negative sense. It is grim but at least it is real. The word utopia represents a negation; it is no place in the original Greek. The word dystopia, on the other hand, is the bad or hard place. When we are in the no place, the virtual utopia of the Internet, we are separated from our bodies and the sensibilities that make us human, denying our finite existence. Would we not rather be in a hard place where we are connected to our feeling of the hardship, where we can touch our reality and each other? This work is not predictive or prescriptive. It is, rather, a description of reality. But we need time to gain understanding. So take the time to stop time - with Bifo.